There all kinds of appearances at San Diego Comic Con, so much that it’s hard to predict who’d appear up next. Celebrities, game developers, and writers all show up to appeal to the populous attending SDCC. 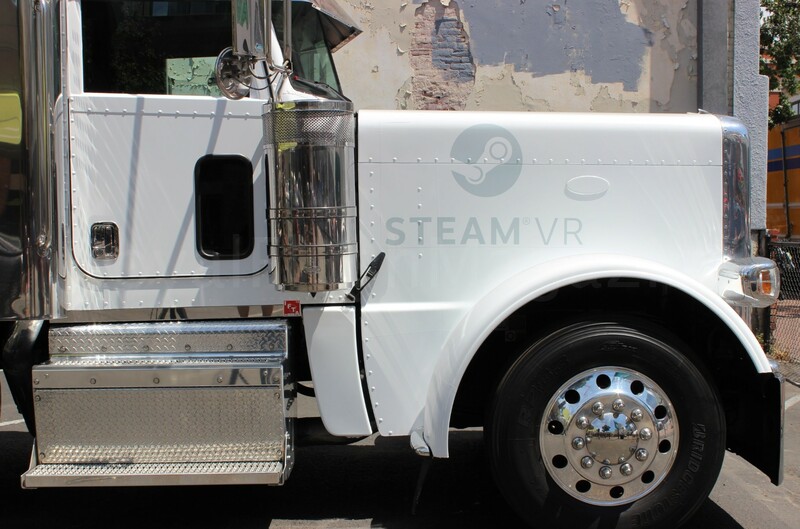 So then why not have HTC show off their latest innovation from their partnership with Valve, the HTC Vive? The Vive is one of the latest in virtual reality headsets that uses Valve‘s Steam VR tracking. RFMag stepped away at the convention center floor to play around with the HTC Vive to give you some info on one of the latest in VR solutions. It’s not just another Oculus. You literally walk around your virtual environment thanks to a Full Room Scale 360 Degree Solution. The demo at SDCC 2015 used empty rooms to give people the space that they needed to walk around freely in their VR worlds. A blue grid appears in front of you when you get too close to an actual wall in the real world. No need to face-plant while standing. We had the chance to explore underwater, cook up recipes in the kitchen, or even try (terribly) to fix an adult-sized robot within Portal’s Aperture Science Laboratories. We were also set up with tracked controllers for each hand, allowing you to not only see your hands while wearing the HTC Vive, but also to give a unique point of interaction with your VR world. The controllers have squeeze levers so that you can intuitively simulate grabbing and releasing items and objects. Near the thumbs were touch pads that gave you additional options depending on the experience you were immersed in. The underwater demo had you standing atop a sunken ship as marine life passed around you. The kitchen demo was more for the use of the controller’s grips. Need an ingredient? Walk over to the fridge, grab the handle, open the door, and pull out what you need. There was also a painter’s demo that allowed you to pick colors using your thumb on the touchpad on one of the controllers. The touch controls seemed sensitive yet responsive as you were able to choose pretty much any RGB color you can think of. The Aperture lab demo was especially interesting. You were able to remove a robot’s face and move its gears and switches about. You were on a moving platform that was taking you from task to task. Some HTC Vive wearers freaked out when they looked over the edge of the platform to see how high up they were, just to give you an idea of how good the visuals were. The HTC Vive itself tracked extremely well, utilizing a 1,200 by 1,080 pixel screen in front of each eye and displaying at 90 frames per second. It contains a gyro sensor, accelerometer, and laser position sensor that work together to ensure that head movement is tracked accurately. Looking around in the demos felt sooth and natural, no image tearing or lag. (Or perhaps I didn’t turn my head fast enough.) The HTC Vive also sports an audio jack for feeding sound to the headset of your choice. The tracking of where the wearer is in the moveable space is powered by a pair of Steam VR base stations. 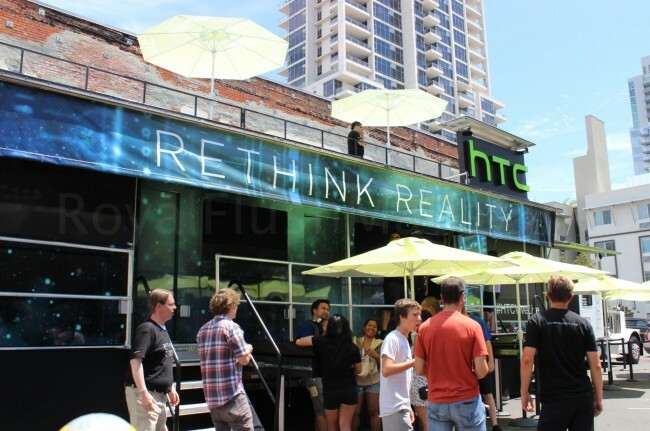 Although, we didn’t know how big the test spaces were at the SDCC pop-up location, the Steam VR stations are reported to track you and your HTC Vive in spaces up to 15 by 15 ft., as specified on http://www.HTCvr.com/. The HTC Vive endeavors to add much depth to gaming and beyond with all of the potential applications of its hardware and Steam VR. The experience is quite immersive so hopefully we don’t have a string of people running into walls or falling over. 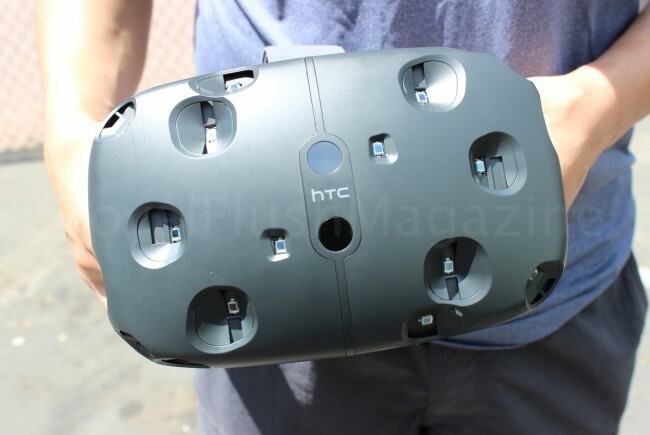 HTC released a VR developer edition in the spring and the consumer edition is expected to be available by the end of 2015. Look into it some more for yourself at http://www.HTCvr.com/.